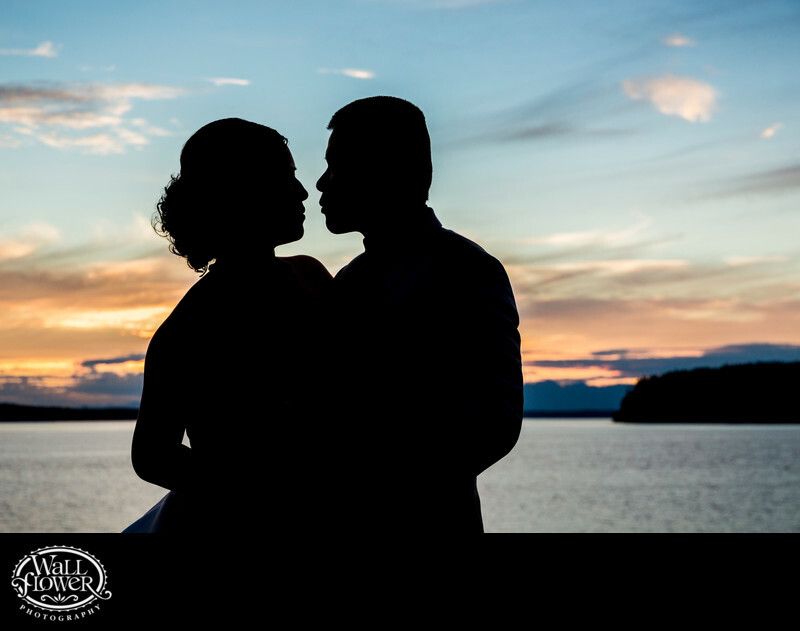 The famous Chambers Bay Golf Course in University Place, Washington, is arguably the best wedding venue for sunsets in the entire Seattle-Tacoma region. Its perspective looking west over the sparkling waters of Puget Sound is perfect for sunset photography, whether by the wedding pavilion and patio or down closer to the water's edge, which is where this portrait was shot. Turning off the photo lights allowed the bride and groom to be rendered as silhouettes, which requires precise profile posing to look its best. To see lots of photos of photographed by Wallflower Photography at this venue, visit our Chambers Bay wedding portfolio website at www.chambersbaywedding.com.